Story of the patch and a photo gallery of all previous yearly patches. Come and enjoy new boardwalks, newly restored acres of bird habitat, and two new rookery islands! To help celebrate our 50th anniversary, we have special events scheduled for wildlife photography. The kiosk at Boy Scout Woods opens on Friday, March 29 and closes on Sunday, May 5. Birding Walks & Outings: The Tropical Birding guides will lead 3 free bird walks a day, 5 days a week (every day except Tuesday and Wednesday) in our High Island sanctuaries and surrounding hotspots. No preregistration is required. The walks begin on Thursday, April 4 and end on Monday, April 29. The 8:30 AM walk is at Boy Scout Woods. The Noon shorebird walk meets at the gate for Boy Scout Woods and visits various sites for shorebirds and other coastal birds. The 4:00 walk starts at the Old Mexico Rd parking lot at Smith Oaks and searches for warblers in the woods followed by a quick circuit of the Rookery. Photography Walks & Outings: The Tropical Birding guides will also offer free photography walks and outings, 5 days a week. The walks begin on Thursday, April 4 and end on Monday, April 29. No preregistration is required. Tropical Birding will alternate days between Smith Oaks Rookery (Thursday, Saturday, and Monday) and Bolivar Peninsula (Friday and Sunday). For the Rookery walks, meet at the Old Mexico Rd. parking lot at 4 PM. The Bolivar Bird Photography Outing will meet in front of Boy Scout Woods at 3 PM and then continue on to waterbird sites along the Bolivar Peninsula via personal vehicles. Carpooling is encouraged. Tropical Birding has secured a partnership with Olympus Cameras to provide field testing of their bird photography camera setups. Visitors will be able to try out the next generation of lighter, faster, smarter cameras. Bird-friendly Plant Sale: If you want to attract birds to your yard, plan to visit the annual High Island Bird-friendly Plant Sale at Boy Scout Woods. The sale starts on April 1 and lasts until there are no more plants. Natives grown at Houston Audubon's Natives Nursery at Edith L. Moore Nature Sanctuary will be for sale. Houston Audubon has 4 sanctuaries at High Island. Boy Scout Woods is the headquarters, which is staffed by volunteers during peak spring migration season from mid-March to mid-May. Smith Oaks is the largest sanctuary and home to the Rookery. The Rookery is fascinating to visit throughout the year. The High Island sanctuaries are fee sites. The fee helps defray the costs of maintenance, utilities and improvements for the entire Houston Audubon sanctuary system. A day pass costs $8, or for $30 a patch may be purchased which gives you an unlimited number of admissions to all High Island sanctuaries for one year. Children under 18 years old are free. High Island residents are also free (proof of residency such as a driver's license is needed). The kiosk at Boy Scout Woods should be your first stop during the spring season. There you can purchase a day pass or patch and find out about the latest sightings. Our friendly volunteers are glad to assist you with directions and provide help with which areas may be best suited for your interests. TOS Partnership: A new partnership in High Island makes it easier to visit both Texas Ornithological Society (TOS) and Houston Audubon sanctuaries. 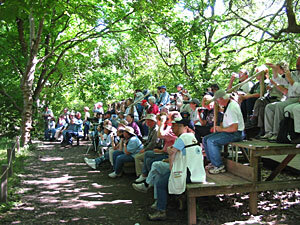 Purchase of a day pass or annual patch from Houston Audubon will provide passage to the ever-popular Hooks Woods on First St.
For the past 11 years during spring migration season, the professional guides at Tropical Birding have volunteered their services, enabling us to offer free birding walks at High Island and Bolivar Flats. Thank you, Tropical Birding! Our High Island sanctuaries are open daily throughout the year. Peak spring migration season is from mid-March to mid-May. Numbers are highest during a "fallout", which sometimes occurs with a fast-moving cold front. During fall migration, late September to mid-October usually produce the best results. No dogs or other domestic animals are allowed at any of the High Island Sanctuaries. The use of laser pointers is prohibited. No pishing or use of playback devices unless special permission is obtained. Drone photography is prohibited. Smoking is prohibited except in the parking lots. Please be considerate of our neighbors! Birds can be found almost anywhere on High Island, including our neighbors' yards. Please do not enter their yards and be careful when you aim your binoculars, as some people get the idea that birders are looking in their windows and invading their privacy. Please note that the oilfield roads are temporarily inaccessible. Please support local businesses and civic organizations as much as possible. Communities are more willing to support local conservation efforts if they feel protected habitat helps the local economy. See the list of accommodations, food, and other useful addresses compiled by Houston Audubon members.